Remember: You can donate to the SPOTS campaign all year long! What is the SPOTS Giving Campaign? SPOTS is a more simple approach to fundraising. Instead of you and your child selling items door-to-door, simply make a donation to our tax-deductible Giving Campaign, SPOTS, and help us Support and Promote Our Teachers and Students. This way 100% of your tax-deductible donation stays at Livsey and through the PTO supports every student and teacher. What Does the PTO Do with Funds Raised? We need your help to continue the great tradition of support from our Livsey community. As budgets across the State and in the School District get tighter, parent-teacher organizations must supply more resources to our schools. The Livsey PTO with your help will continue to support vital programs that might otherwise be unavailable in our much-loved neighborhood school—Livsey Elementary. 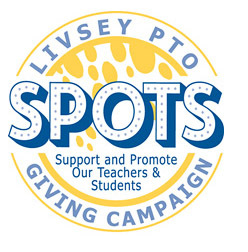 Who Can Participate in the SPOTS Giving Campaign? Everyone! Please pass this letter along to family members, friends and neighbors. Since we will once again NOT be participating in a catalog sales fundraiser, we hope that you will instead give via a 100% tax-deductible donation, and consider asking those friends and family members who typically support other fundraising efforts to consider making a donation as well. Everyone! Please pass this letter along to family members, friends and neighbors. We will once again NOT be participating in a catalog sales fundraiser. So we hope that you will choose to participate in either (or both!) our Whooo’s Reading “Reading-raiser”, which you can read about under the Whooo’s Reading tab of the website, or our SPOTS Giving Campaign. To accomplish our goals and to continue providing quality programs for every Livsey student, we would like to raise a minimum of $75 per family through the combined efforts of Whooo’s Reading and SPOTS. We recognize that not everyone can afford this and some families can give more. Therefore, please give as you are able. Your donation is fully tax-deductible through either campaign (you will receive a receipt to keep on file for tax purposes). And you’re supporting the educational enhancements that help make our neighborhood school thrive! Our goal for JUST the SPOTS Giving Campaign for the 2017-2018 school year is $5,000. Thank you ahead of time for your generous support!